August 2017: We understand that Highways England were studying a range of traffic works for the Thames Valley including a Junction 3A on the M40 serving eastern High Wycombe. Any updates will be displayed here. 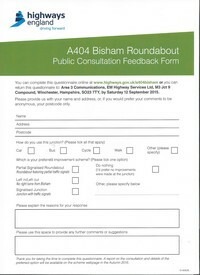 The Highway's Agency has proposed several options for the improvement of the Bisham Roundabout on the A404. These were exposed at an exhibition on 19 / 20 Jun 15. 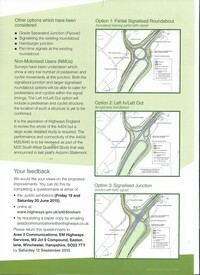 Details of the 3 prominent options are shown here. 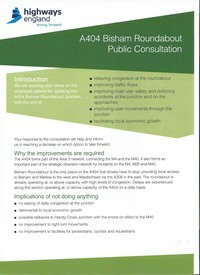 The options of a flyover or an underpass linking the Bisham and Maidenhead roads were displayed. Making changes that speed up traffic on the A404 but which result in longer queues at both ends and the same total transit time makes little sense. The aim must surely be to facilitate the egress of local traffic. Please look at the illustrated options and respond if you so wish.